The red box is showing you where this page is located or in other words what button to press to get to the dailies page, though I made it very obvious by naming the page dailies but to prevent any confusion or questions on how to find the page there you go! In the orange box you see the words Dailies (Main) it's pretty self explanatory; those are the dailies most users do, all activities listed in the main dailies section are freebies a.k.a free items/IP. The big green line underlining Gold Account Corner, If you don't have an account member than you can skip over this part, if you are then it's basically a bonus freebies only available to gold membership holders. In the purple box you see the words Daily Quests (Secondary) notice how this says Daily Quests instead of Dailies, quests involve spending money to earn or lose more money. You may be wondering, Why is it on the dailies page, it costs money so why would I bother to do it?, though more users do their daily freebies (Dailies), there are a very big portion of users who do the quests mostly because of the prizes associated with the quests; per quest you do you earn 1 QP (Quest Point) which can be used to buy things from the quest store. In the black box, it's basically a reminder to do things that you may regret if you forget or don't so please pay attention to the messages followed with the title. 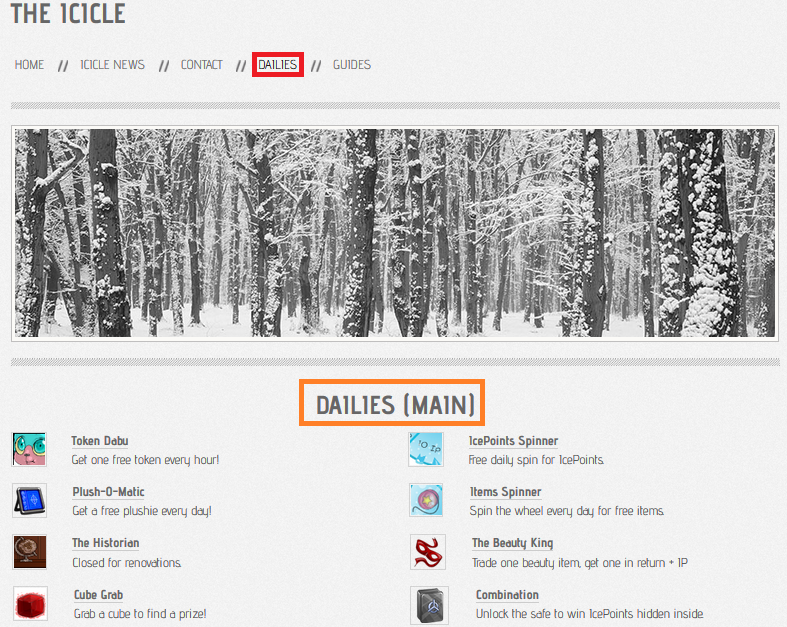 FAQ: What is the Dailies page for? A: The Dailies page is a place where all your dailies are gathered, so going around Icepets looking for the right place to find your freebies is only a click away, All the special advent dailies and features (e.g. Link to SOTM items) will also be posted there to also remind you to do them with your other dailies, and will also be removed when the advent feature or daily ends. I know this tutorial is probably something you won't read, but if I haven't lost you yet and you're still reading this, you are awesome :P So next off I will explain the contact page! This page is currently used for reporting and requesting things for example, any broken links, spelling errors, grammar mistakes, things that need updating, or button/banner requests. Since there are already instructions on that page I don't really need to go over anything else. Brief summary of the purpose on that page is, if there is something wrong or something you need help with just use it! FAQ: What are guide buttons and banners? A: They are coded to go to certain guides and places on the site, They are made to make our guides quickly accessible and more convenient, e.g., if you were to do the plot, most likely you won't finish in a days time, or will probably accidentally close the guide window, and that is where the banners and buttons come in, you can put them into your siggy, profile, etc...., so when those things happen you just press on them and jump back onto the guide you were previously looking at. 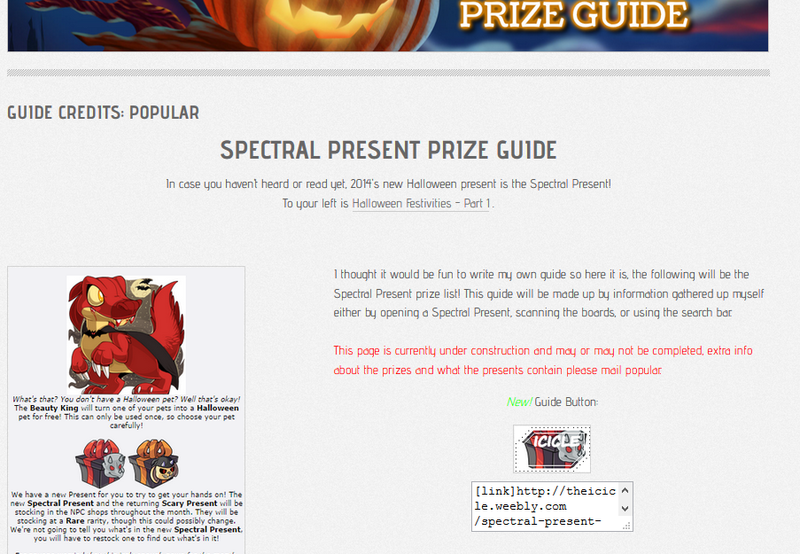 These coding/banner/buttons, can be found either in the Banner/Button Pub, or the bottom or sideline of the guide page. If you do not find one for the specific guide your looking at, feel free to request one using the contact page. Another thing I would like to explain is the words in the red, normally when you see a sentence in red it's either talking about how the page is under construction or it's something important so I would highly suggest you read it instead of skipping over it. You are now done reading The Icicle Tutorial, thank you for choosing this site and I hope you find The Icicle very useful to your Icepets needs. For additional info or inquiry's please use the contact page to ask me directly or through Icepets mail, my username is Popular. FAQ: I have written a guide and would greatly appreciate if you put it on your site. A: If you have made a guide you would me to put on the site, (you will get guide credits for it, don't worry) please contact me through the Contact form or Icepets Mail. More guides will be written very soon!